Systems Manager: Chrome OS Management for Enterprise Users! As a leader in both the cloud and the end-device space, Google recognizes the critical role that all endpoints play in cloud security. Endpoint management is essential to an organization’s cloud, network, and data security initiatives, but managing endpoints can be burdensome on IT teams, especially when teams are forced into multiple solutions for managing different types of endpoints (Chrome OS, iOS, macOS, Android, and Windows). 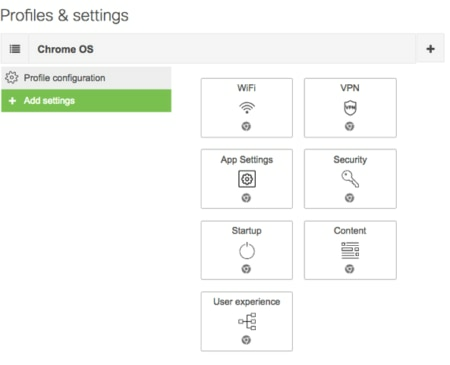 To help customers streamline the management of all devices in a single solution, the Meraki Systems Manager team has worked closely with Google to integrate native Chrome Enterprise management tools into Systems Manager. The Meraki team is excited to announce a suite of new management features for Chrome Enterprise users. These new Chrome Enterprise management capabilities enable quick and easy provisioning, efficient fleet management, uninterrupted workflow/adjustments, and ongoing updates. With this integration, customers can now leverage Meraki System Manager’s intuitive interface, tags management, and differentiated settings to manage Chrome OS devices right alongside other platforms. The screenshot below shows some of what’s available in SM’s configuration settings, including settings for Wi-Fi, VPN, App Settings, Security, Startup, Content, and User experience. Register for our upcoming webinar to learn more about these features and cross-device updates on Systems Manager, or take a look at our Chrome OS documentation guides. For a free trial, please reach out to your Meraki rep to get started! Please note: management features are available for Chrome Enterprise users only at launch. To learn more about Chrome OS endpoint security initiatives, please refer to Google’s Connected Workspaces site.